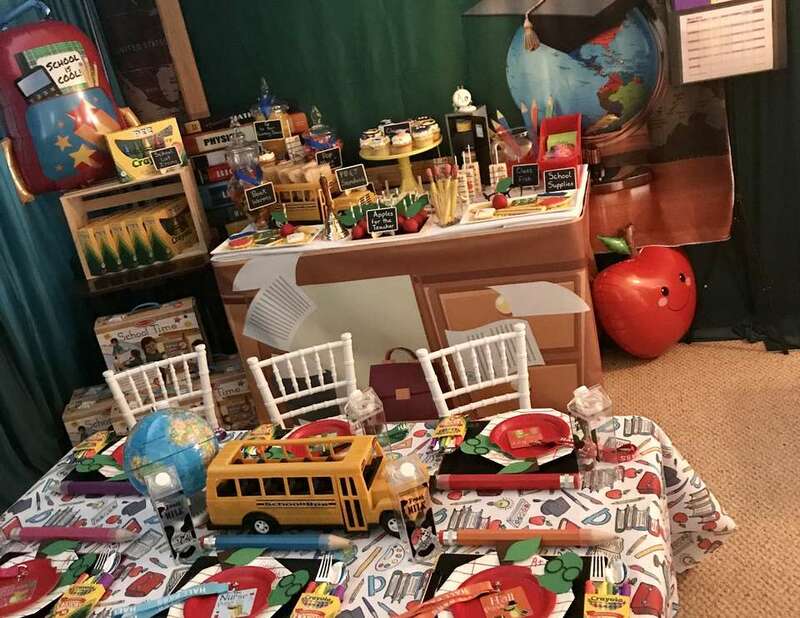 When the Birthday boy is obsessed with school it’s a must that you transform the designated party space into his dream classroom! 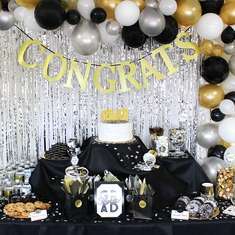 Complete with all the details that truly made his special day a Classroom Celebration! I literally searched the entire universe to find the perfect fabric for the kids guest table. I needed it to tell the story I was trying to convey through my design. I wanted a school pattern that was not only vintage and but had just the right amount of whimsy! Time to decorate that fabulous tablecloth! I used multi-colored clipboards as the base for the place setting and lined them with chalkboard placements. I customized the cobalt blue striped lunch plates to create notebook pages and dress them up with customized red apple dessert plates which I transformed into particularly eaten red apples which featured a very hungry bookworm! I added some jazz to the utensils as well by hand rolling rainbow colored napkins to look like crayons and placed them inside empty crayon boxes to house the sliver folks and spoons. A modern twist to a traditional milk carton in form of a transparent acrylic milk carton tumbler was added and then I completed the entire setting with individual hall pass lanyards and multi-colored jumbo pencils. Now focusing on the focal wall which featured a chalkboard backdrop and immediately gave the room a classroom ambience. When peered with my Sweet Treat Buffet Table design, it was nothing sort of magical! Woo’em Designs absolutely nailed my vision of the custom “teachers desk” table wrap design for the Sweet Treat Buffet Table! It was so whimsical yet realistic and interactive with papers flying off of it and out of the drawers! I used decorative props on the table to drive home the theme. From Mini chalkboard labels, a mini locker, teachers glasses, a fish bowl, all the way to a vintage school bell! The Sweet Treats were not only yummy but also pleasing to the eye! Edible art is what I like to call them. Mirranda at the Cupcake Studio did a phenomenal job on the details of the adorable cupcake toppers! I gave her the theme and color scheme and left her to be creative. Oh boy did she deliver! Meghan at Milk Honey Cakery was the creative genius behind the details and precision on these super cute sugar cookies. The details went all the way down to the math on the chalkboard sugar cookies to add up the the Birthday Boy’s age! Talk about details! Some other sweet details were highlighted throughout the candy display. I did a twist on the traditional graduation medallion by dressing up the glass candy jars with royal blue ribbons but instead of using gold medals I used mini chalkboards to label items. From Gummy “bookworms” and “Pop QUIZ Corn” to “G is for Gummy Bears”! I also featured a PB&J School Bus! A classic school lunch favorite! Besides, am I the only one who thinks a school bus that delivers Peanut butter and Jelly sandwiches is an awesome idea? As if your Sweet palette wasn’t already fulfilled, I also made two different designs for the Rice Krispy Treat Pops: note book pages with sugar pencils and scissors as well and Art pages with sugar crayons! The teacher’s glasses was placed right in front of the Rice Krispy Treat Pops while the mini locker was a perfect home for a cupcake and chocolate covered Oreos! Every classroom also needs a class pet so it was only right that I feature Swedish Fish in a fish bowl. I also made chocolate covered pretzel pencils which I placed in a clear acrylic pencil holder. A School Party wouldn’t be complete without iconic “apples for the teacher”! Candy apples would have been too cliche so I made cake pops with paper leaves instead. In lieu of a platter I placed them on a chalkboard and they were the focal point of the entire table. Fast forwarding to some of the other super cute details! 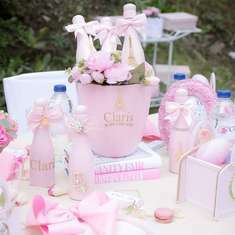 The favors were listed as “School List Items” and flanked by an oversized book bag balloon from Havin A_Party. In every class there are homework folders so it was only fitting that each party guess had their own activity folder. I also featured a colorful cascading organic balloon garland with an oversized school bus balloon. Finally a school themed party would not be complete without the classic brown paper lunch bags that were filled with a turkey and cheese sandwich, a bag of potato chips, apple sauce, a tangerine, a banana and a juice box! The perfect lunch for the perfect school themed party! There wasn’t a detail spared even when it came down to the Birthday boy’s outfit. An “I Love School” navy blue t-shirt was more than fitting. Paired with a navy blazer and suspenders adorned to his denim jeans. The future looks so bright for this 7 year old aspiring teacher/principal! 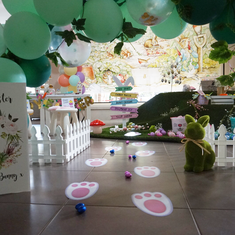 Hope you enjoyed Charlie’s Classroom Celebration as much as I loved designing it! The kids ate from their assigned lunch bags that were filled with a turkey and cheese sandwich, a bag of potato chips, apple sauce, a tangerine, a banana and a juice box. They was also had pepperoni and cheese pizza. Along with classic PB&J sandwiches. There were assorted sodas, juices and bottled water. There were so many sweet treats! 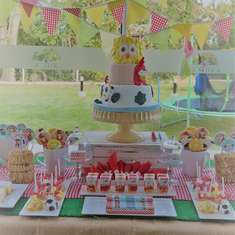 From cupcakes, sugar cookies, Rice Krispy Treat Pops, Chocolate Covered Oreos, Cake Pops, candied popcorn, gummy worms, gummy bears, Bubble gum to Swedish Fish! The party favor were School Desk Brief Cases from Melissa & Doug along with Pez Crayola Activity packs. Each child received an activity folder. The birthday boy’s passion for school was featured through activities such a math quiz, spelling test, Arts & Craft, Coloring, Writing and then fun gym/recess games!